Aviary is scheduled to be open every day 11am- 4pm. Memorial Day thru Labor Day, visitors will have the unique opportunity to walk into the Budgie Aviary and experience the lively and colorful Budgies all around them. 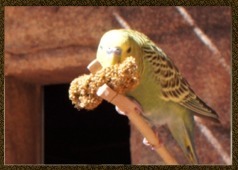 Budgie Seed Sticks are available for just $2.00 and allow visitors to feed the birds from you hand. Budgie Encounters may be subject to change or cancellation. These amazing creatures are wild animals and we can not guarantee that they will land on your stick or stick to our schedule. Budgie Seed Sticks cost $2. There is no cost to enter the Aviary. Guests 12 and under must be accompanied by an adult.